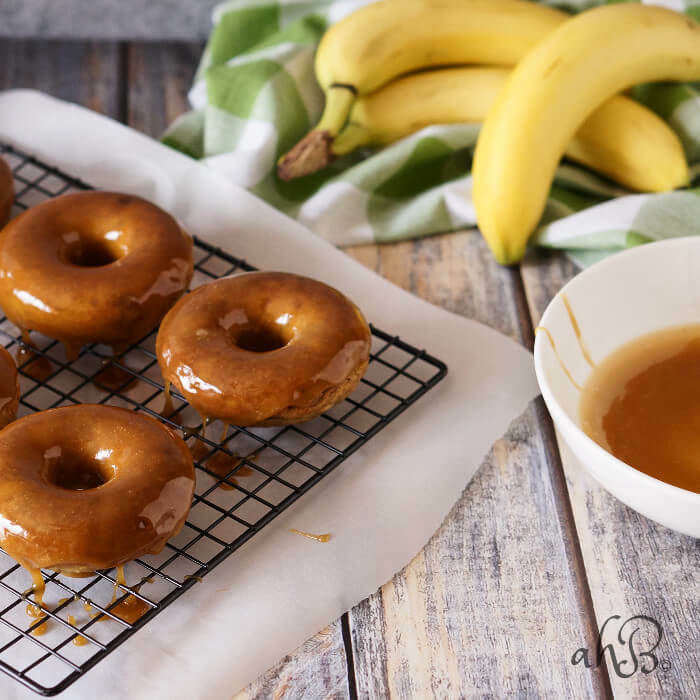 Moist banana bread-like donut dipped in a gorgeous buttery dark caramel glaze that sets up so pretty, with a pinch of salt to even out the sweetness. Dude, these donuts are just as decadent as they sound. The thing that I love the most about these donuts is that most of the ingredients are things you should have on hand. Of course, I love new kitchen gadgets, appliances, and stuff,. But I have to really, really think I’ll use a new kitchen item to make space for it. One thing that I made space for last year and I’ve been so pleased with is my donut pans. Before I got these pans the only kind of donuts I made at home were the old school fried biscuit kind, but these pans have opened up a whole new world of donut flavors, my kids beg for chocolate zucchini donuts. I kind of geek out over donuts. In fact, I have a pinterest board devoted to nothing but donuts. It’s hard not to love them once you realize you can have a dozen mini donuts hot out of the oven in under 10 minutes! 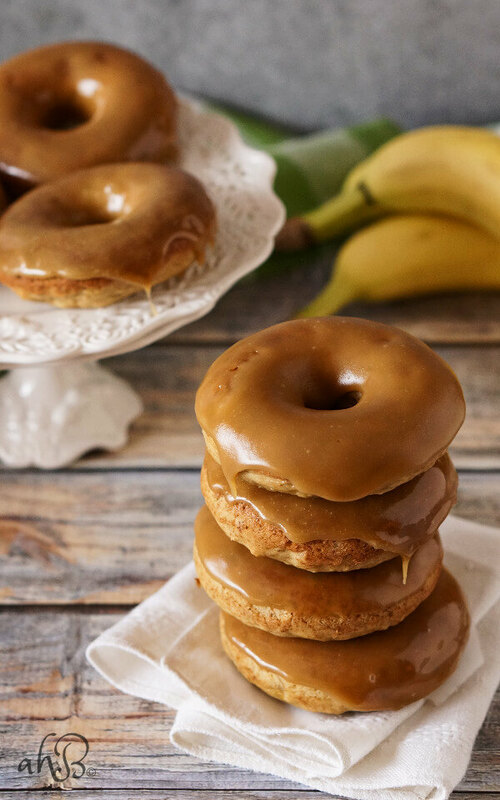 Something I’d like to mention about these banana donuts is this salted caramel glaze. 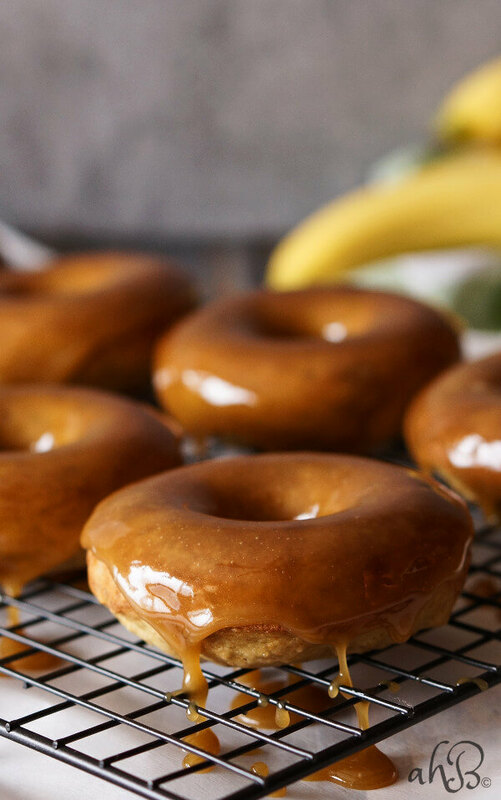 Caramel is delicious stuff for sure, but if you’ve ever made caramel before you know that it can get molten hot and if it gets on you, it will burn, so please use care when glazing your donuts. It also cools off and sets up rather quickly. So If your caramel glaze starts to set up before you’ve finished, just pop it in the microwave for 5-10 seconds and it will go back to dipping consistency, but remember, it gets HOT! 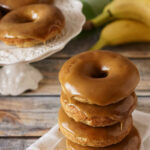 These banana donuts are best when eaten the day they are made. (I haven’t figured out a way to store them that keeps the bottoms from getting soggy. If you have, please email me and let me know!) But they are still good for a few days afterwards. I absolutely love this turquoise colored Wappa pan. It is my favorite donut pan because makes donuts that are nice and big, donut shop sized! Some of the above links are affiliate links. Any purchases made through these link help support AHB at no additional cost to you. We appreciate your support. In a medium sized mixing bowl, mash the bananas with a fork. Add the brown sugar, sugar, oil, vanilla, sour cream, and egg and mix well. Add the remaining dry ingredients and stir until just combined. Don't over mix. Spray the donut pans with nonstick baking spray. Pour the donut batter into a large ziplock bag and snip off one corner with scissors so that you can pipe the batter into the donut pan. Bake at 350 degrees for about 8-10 minutes for mini donuts or 14-15 minutes for large donuts. Donuts will be ready when a toothpick inserted in the middle comes out clean or when you press on it slightly and it springs back. Allow the donuts to cool and remove from the pan. To prepare the glaze, bring the sugar, salt, butter, and milk to boil in a small saucepan over medium heat stirring constantly. Allow to boil one minute, while stirring. Continue stirring for 3 minutes until the glaze is cool enough to use. Pour the glaze into a shallow dish. Dip the top of each donut into the glaze and remove to a wire rack to cool and set up. If the glaze begins to set up before you are finished, heat it in the microwave for 5-10 seconds to warm it back up, taking care to make sure it's not too hot to work with before beginning again. This recipe will make approximately 4 dozen mini donuts or 8-9 large donuts. Love love love homemade donuts! I have a donut pan I don’t use often enough. I must try this recipe soon. WOW! WOW! Is all I can say–these look absolutely incredible! The salted caramel is such a compliment to these! But then I think salted caramel compliments almost everything. LOL. It’s hard to go wrong with a classic salted caramel. I love my donut pan! Cake donuts are my favourite and mean that I can indulge in donuts far more often than if they were fried!! I agree, we definitely enjoy donuts more now that we can make cake donuts than we did the fried version. Frying just makes such a mess! These doughnuts look so good I want to reach through the screen and grab four! I can’t wait to try these! That salted caramel glaze is making my mouth water. Yum! These look delicious! I may have to get me a donut pay for sure. 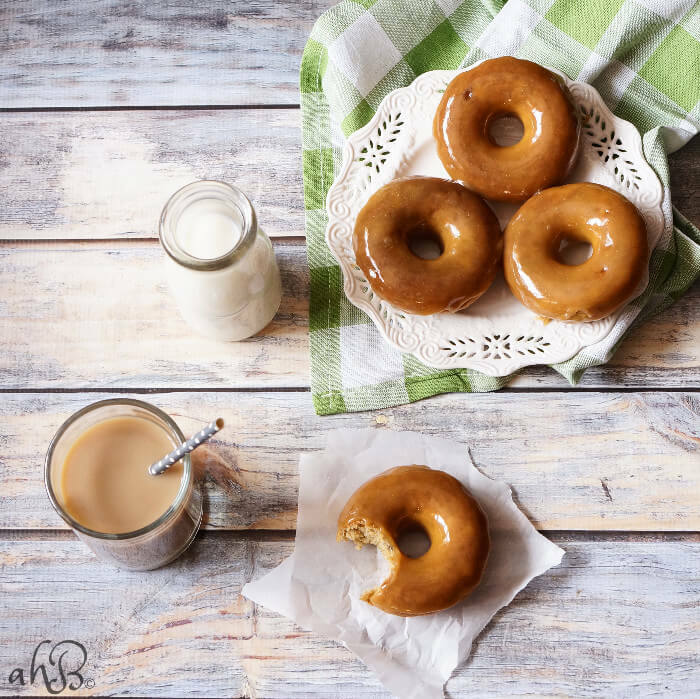 🙂 That picture of the caramel glaze dripping off the donut – made my mouth water — I felt like I could reach out and catch it with my finger and lick it off! Why oh why don’t you move closer to me? And I agree — fresh french fries are the best!!! love me some homemade fries. That caramel glaze is ah-mazing! I might have ate a few spoonfuls of it just by itself.